Cities throughout New Jersey offer one-of-a-kind experiences that will leave lasting memories long after your visit. Enjoy “the shore” cities of Cape May, Atlantic City or Asbury Park. Explore rich culture in cities like Princeton and New Brunswick, both part of our nation’s history. The Garden State is waiting for you to explore. Home to High Point State Park—the state’s highest point, naturally—the Skylands Region is where you can observe nature among rolling hills, river valleys and forest trails. Hike and snowboard along New Jersey’s 72 miles of Appalachian Trail, or watch the wolves at Lakota Wolf Preserve. 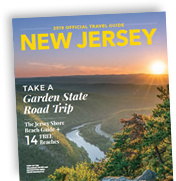 Along New Jersey’s northeastern border lies the Gateway Region, rich in culture and history. Visit Ellis Island and the majestic Statue of Liberty, New Jersey Performing Arts Center in Newark, and Thomas Edison’s home in West Orange. Don’t miss dinner at a diner—this region has the most in the world. Charming main streets, historical sites and award-winning wineries welcome you to New Jersey’s Delaware River Region. Kayak along the river, retrace history, or simply shop, dine and relax your way through this eclectic area. With more than 90 miles of white-sand beaches, New Jersey’s Shore provides more than your standard day at the beach. While here, visit lighthouses and museums, and savor farm-fresh fruits and vegetables from a rustic roadside stand—or cooked up at a local farm-to-table restaurant. With fourteen beaches of which seven are free, New Jersey’s Southern Shore has a beach for everyone. Ocean City was named Coastal Living’s Best Beach in America, peaceful Cape May oozes Victorian charm, and The Wildwoods promises year-round fun with a full calendar of events.